Kids, sure, but grownups too? We're deep into the third month of the 2014 Winter Olympics—that's how long they've been going on, right?—and the games' gazillion sponsors are still rolling out TV spots in hopes that at least some viewers are still glued to their screens. One of the prevalent themes this year has been kids getting inspired by Olympic athletes, often with heartwarming results. (The other major trend: AMERICA.) 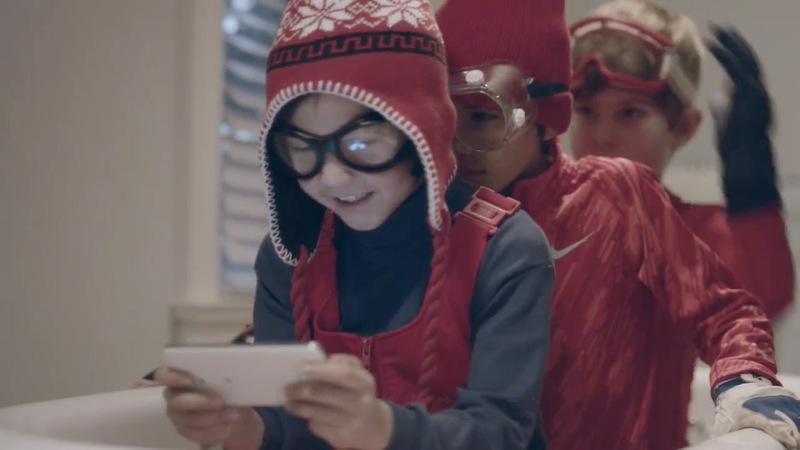 To promote its Galaxy line, Samsung, "the official smartphone partner of the U.S. Olympic Team," jumps on the kid bandwagon with its own Sochi spot, "And … Go!" The ad, from 72andSunny, follows a number of different storylines, most of which focus on how the Galaxy helps children play out their own Olympic dreams at home. For instance, some would-be bobsledders pretend they're racing down a mountain thanks to a sledding game on their Galaxy. But rather than just stick to a single idea, "And … Go!" also makes an attempt to appeal to those tricky millennials by throwing in a few scenes of tech-savvy office workers chattering about figure skating and Twitter followers. Unsurprisingly, it doesn't quite work. "And … Go!" feels like two different spots, one of which is your typical, family-friendly fare (while not exactly brilliant, they at least work together as a coherent unit), while the other is a misguided attempt at being edgy (what seems to be an attempt at modern, witty dialogue comes off as a poor imitation of a Girls episode). Inserted among those nice clips of cute kids, the adults' banter is just annoying. It's a shame the grownups had to ruin things.